When Willard became a surprise box office hit in 1971, it didn't take long for a sequel to be put into production. Ben, released the following year, finds the central rat moving to a new owner. Scream Factory brings both movies, which had been unavailable on home video for a long time, to DVD/Blu-ray combo pack on May 16. (Read my review of Willard right here.) They had to use the best print they could find, which means that certain scenes – mostly those set in darkness – are a bit grainy, but that's okay because Ben is a horror flick worthy of being preserved. With Willard Stiles dead, Ben and the other rats go on a reign of terror. Eventually, the rodent leader finds his way to Danny (Lee Montgomery), a marionette-loving little boy who lives with his single mother (Rosemary Murphy) and sister (Meredith Baxter). He hides Ben from his family, even when a detective (Joseph Campanella) comes around to ask whether anyone has seen the vermin who are tearing up the town. Eventually, little Danny gets caught right in the middle of the rats' efforts to wreak havoc, leading to a dramatic showdown in the sewers. Ben is to Willard what Aliens is to Alien. In both cases, the originals are slow-burn stories that build to shockingly grotesque climaxes, whereas the sequels start packing in the action right away. Ben has rat attacks all over the place, each one bigger and crazier than the one before. Everything leads to the conclusion, in which millions of rats scamper through the sewers as workers try to flame them out with blowtorches, while Danny's sister attempts to save him from a grisly fate. Even if it's more overt and less subtly humorous than its predecessor, Ben is still fun and effective. Director Phil Karlson (Walking Tall) makes sure to pack as many rats onscreen at a time as possible to enhance the story's natural repulsiveness. You're virtually guaranteed to squirm in your seat watching all the varied ways the creatures attack. Decent performances help to give the horror scenes meaning. Lee Montgomery nicely conveys the sense that Danny is a lonely boy who forms a bond with his rat friend. 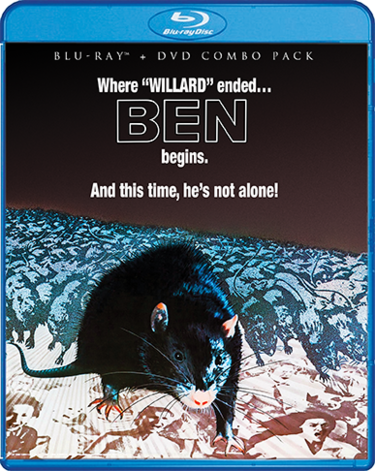 Ben can be enjoyed on its own, but it absolutely makes a great double feature with Willard. These are two of the finest animal-related chillers ever made. Bonus features in the DVD/Blu-ray combo pack start with a nine-minute interview with the now-grown Lee Montgomery. He describes his affection for his costars (both human and rodent) and explains how he got the role of Danny. He also tells a tale about meeting Willard star Bruce Davison. The actor is clearly very excited to have his work as Danny available to the public again. Elsewhere on the disc are the original theatrical trailer, a TV spot, a radio ad, and a still gallery. All are enjoyable to flip through. For more information on this and other great titles, please visit the Scream Factory website. Ben is rated PG for rat-related violence. The running time is 1 hour and 34 minutes.